He may be beginningless or with a beginning, harsh or very tender, most compassionate or merciless, more opulent and powerful than the Lord of Vaikuṇṭha or just an ordinary human being – the son of the Lord of Vraja is always my worshipable Lord, birth after birth! Stavāmṛta Kaṇā Vyākhyā: In his sādhakāveśa the most earnest Shri Raghunath Das describes his loyalty to his worshipable deity Krishna, the embodiment of sweetness, here. In the Śruti-scriptures, Krishna is said to be the Original Personality of Godhead and the fountainhead of all Viṣṇu-avatāras like Shri Nārāyaṇa, but the people of Vraja, who are fixed in their sweet conception of him, don’t love him just because of seeing any such quality in him. Their love for Krishna is natural; it is not created by seeing some quality in him, it does not diminish by seeing some fault in him and it does not increase by seeing more prominent qualities in him. This love arises naturally and is not dependent on virtues or faults at all. It is causeless and natural – doṣeṇa kṣayitāṁ guṇena gurutāṁ kenāpy anātanvatī premnaḥ svārasikasya kasyacid iyaṁ vikrīḍati prakriyā (Vidagdha Madhava). Such is the nature of the love of Vraja. Shri Raghunath Das is Shri Radha’s eternally perfect maidservant, therefore his love is also eternally perfect. Those who worship in the Vraja-mood are similarly fixed in Krishna in this way. In this single verse Mahāmuni Veda-Vyāsa ascertained the basic truth of the whole Srimad Bhāgavata. Such basic truths are only uttered once in the scriptures and thereafter no more. Hence the verse kṛṣṇas tu bhagavān svayam appears only once in the entire Srimad Bhāgavata. Therefore this verse is completely independent from whatever other truths Srimad Bhāgavata promulgates. Just as a king proudly places his victory-flag above everyone’s head to show his supremacy, this verse proudly flutters above all the other verses of the Srimad Bhāgavata. This verse ascertains that the all-powerful supreme truth Krishna is not a fraction, but the whole, he is not a phase of the moon, but he is the full moon, he is not a puruṣa (a mere man), but he is Puruṣotta¬ma (the supreme person) and he is not the Lord, but he is the Original Lord. 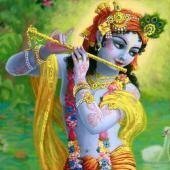 He is the original abode of all the forms of Godhead and Their potencies like majesty and sweetness. “The beginningless and primeval fountainhead of all avatāras, the most compassionate and qualified Lord, is always manifest in his Vrindavan playground, where his pastimes have a beginning”.